I think we’ve all ended up in the situation where we have had to design a small or compact bathroom space. It’s not an easy task when you’re trying to place a toilet, basin and shower into a small space. Long and rectangular bathrooms that are galley style can be one of the hardest to design, but with the right bathroom products, colour and plenty of light, you can turn this small bathroom into a stylish space. The first step in the process is to determine if a shower is the right choice for you. In many smaller bathrooms, a bath is not an ideal choice and will take up way too much of your floor space. Quadrant shower trays are a top choice for compact bathrooms, these shower trays can be fitted into the corner of the bathroom maximising your floor space. The great thing about these shower trays is the gentle curve that they offer, you can base your entire design around this stylish tray. Another option is a wet room, though there are many people that will choose quadrant shower trays over a wet room design due to convenience and practicality. Even in the smallest of bathrooms you want some form of storage, without it your bathroom will become cluttered and messy. Keeping in with your quadrant shower trays you can choose a vanity unit that includes a basin, this way you are maximising your space and making the most of what space you have available. Vanities are essential for any bathroom, but I feel they are more important in a smaller bathroom area. It only takes a few items to be left out for a small space to look messy and cluttered. Toilets come in a choice of designs. 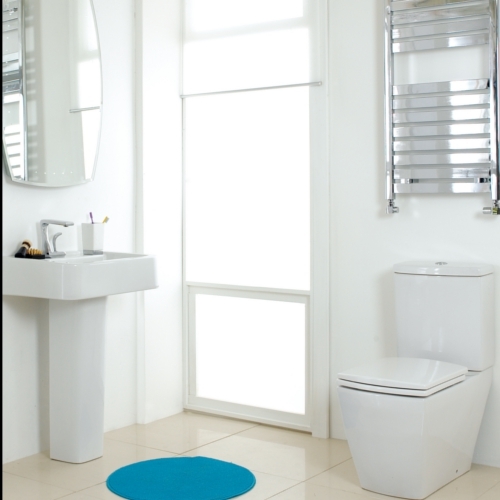 Now if you have chosen quadrant shower trays then you want a toilet that is oval or round, back to wall toilets are exceptionally popular and ideal for the smaller bathroom space. These toilets have the cistern hidden behind the wall, this means only the toilet bowl and pedestal are in the room, saving you plenty of space when you need it most. When designing a compact bathroom you will concentrate on maximising the space you have available, but another very important aspect is the colour you choose. You want an abundance of natural light, using large windows wherever possible and combine that with white walls and floor and your bathroom will feel spacious, airy and bright. The bidet, a luxurious bathroom addition that is often misunderstood. Dating back centuries, the bidet has been something of a grey area in bathrooms, but as bathrooms are designed to luxurious standards, the bidet is making a comeback. The bidet has been gracing bathrooms around the world for many years and has increased in popularity the last few years. In many cases they have been installed for show, a luxurious edge on a bathroom design. What many don’t know is that the simple bidet is a hygienic choice for any bathroom. The ideal solution for the elderly and is also known to be a must for those who suffer from urinary tract infections. While the bidet may just become an item on show in your luxury bathroom, it’s not as simple as all that. Bidets have taps and you need to choose your bidet taps with care. You want them to blend in with all your other fixtures and fittings in the space, complement the bathroom and maybe even become the wow statement you were hoping to achieve. Bidet taps are simple, they are a single tap with a level to manage the water pressure and temperature. The spout is somewhat different from a regular tap in that you can move it to the direction you want it to flow. The CU Series Bidet Mixer is a fantastic choice for the modern bathroom where you have already chose square taps and products for your bathroom. These bidet taps are square in design, very stylish and will blend in beautifully with your current design. The only cylindrical part on this bidet tap is the spout, which you can move as you wish. The PL Series is a cylindrical design. 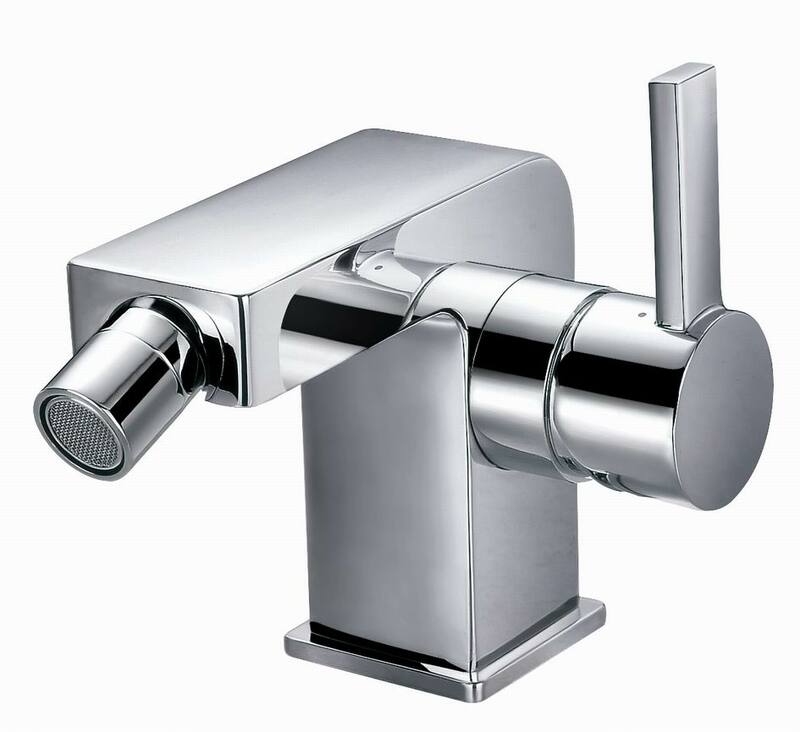 It’s a modern and stylish design finished in gleaming chrome to complement any bathroom design. A single level manages water pressure and temperature and again the spout can be moved to direct water flow. Then there is the AR Series, also modern bidet taps. These are cylindrical in design to complement any modern or traditional bathroom. These bidet taps also give you control of the direction of the water flow with a lever that manages temperature and pressure. Remember that you want everything to blend in together when designing your bathroom. If you have chosen straight lines, such as squares and rectangles from your bathroom products to taps, the you want a square designed bidet tap to bring the design together and give your bathroom a sophisticated finish. 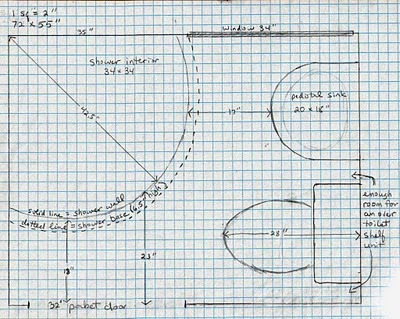 When renovating a compact bathroom so much time needs to be spent on the layout and functionality of the space. When working with a smaller bathroom you are limited to your design layout, of course a large oval bath in the centre of the room is not a practical choice, never mind you won’t be able to move. A bathroom with only a bath and nothing else is definitely not the bathroom design you are aiming for. I’ve worked with some small bathrooms, they are becoming more common in homes across the UK and the one thing I have learned is that the planning stage is imperative. Measure out the space of the bathroom and then you can start working on the bathroom products, where they will fit into the bathroom and maximise your floor space. I usually prefer to add a shower into a smaller bathroom, this leaves you with ample space to add your vanity with inset basin, your toilet and other accessories such as your designer radiator. When it comes to smaller bathrooms a shower enclosure with a swinging door is not the most practical solution. If you choose a shower enclosure with a pivot or hinged door then you have to start worrying about how far the door can open before it is stopped by the vanity or toilet. Now as you can imagine having a door that swings open and it not opening all the way will leave you squeezing through the opening of your shower door each time you want a shower. I don’t know about you, but when I have a shower I want it to be practical, functional and convenient and squeezing through a door space doesn’t tick any of those boxes. The top choice for the smaller bathroom is sliding door shower enclosures. These give you the ability to enjoy the advantages of a shower and not worry about how much space the doors will take up. The sliding door shower enclosures do what it says on the box, the door slides open leaving you ample space to get in and out of the bathroom and you don’t have to worry about the door being obstructed in any way. Other advantages to the sliding door shower enclosures are that they are minimalistic in design and even better they are easy to clean and maintain, making them the most suitable option for any small or large bathroom design. Often you’ll step into your bathroom and think it’s time for a change, bathroom designs change constantly. 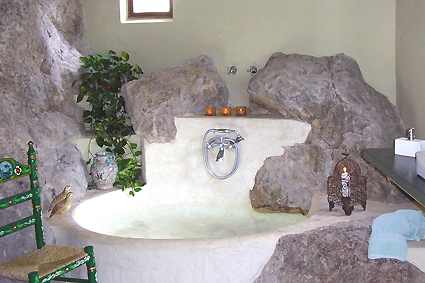 Take this year for example, it’s the year of luxury and spa inspired bathrooms. Now unless you’re ready to do a complete bathroom make over, just a few changes and additions can update your bathroom and have it looking new again. 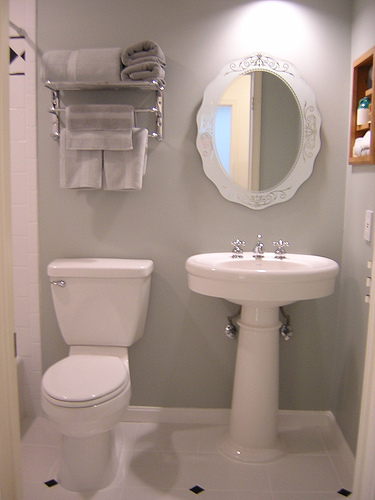 There are a few small things you can do that make a big difference, such as giving your bathroom a new paint job. Choose light colours such as white or natural tones to really enhance the space and make the bathroom feel bigger than it is. Remove any chipped tiles and replace them and re-grout any areas that need it. These can be done over a weekend and it’s not expensive to make the small changes needed to give your bathroom a new lease on life. Shower heads get old and outdated and if you have a traditional bathroom, taking a look at new shower sets may be the ideal solution. Choose ones that offer you the convenience while finished in stunning chrome to really give your bathroom a boost. A radiator in the bathroom can make a huge impact on the space, especially during the colder winter months. The bathroom radiators that you get these days are modern in design, finished to perfection in gleaming chrome and they become the centre piece of your bathroom making a statement that the bathroom is an updated space. You don’t have to start replacing everything in the bathroom to give it an update, in fact you probably don’t want to spend too much money at all, which is why using bathroom cabinet lighting to add the additional light is so advantageous. Bathroom cabinet lighting is available in a range of design choices to complement your new updated bathroom, give your bathroom the extra light it needs and enables you to shine the light where you need it most. You can hang these lights over your basin vanity to shine on your basin for getting ready early in the morning or have them shine over your bathroom mirror to help you get a brighter reflection when getting ready. As you can see subtle changes can make a huge difference to your bathroom design and bring it up to date without costing a fortune. I don’t know about you but I love a quick shower in the summer time and a long hot bath in the winter. Of course not all bathrooms give us the ability to have both a shower and a bath in our bathrooms, which is why the shower baths give us the ability to enjoy the best of both. The great thing about shower baths is the ability to fit them into any bathroom design, both traditional and modern bathrooms can benefit from the convenience of these baths. There are also compact baths available so you can enjoy the best of both in a smaller bathroom. Be aware that shower baths come in a selection of styles, so you need to have a clear idea in your head of what you want your bath to look like, do you want a curved front if your have rounded bathroom items already in your bathroom or is a straight design a better option. All the shower baths have 6mm toughened glass shower screens with chrome profiles which blend in beautifully with any bathroom design, enhancing the space and adding an elegant and stylish twist to your overall bathroom design. There is a selection of shower baths to choose from, here are a couple of the top favourites. The Capri shower baths have a wonderful curved from that are available in both left and right designs to fit into any bathroom. They include a 6mm toughened glass bath screen with chrome profiles. Then there is the Napoli with a dedicated bath screen. These shower baths also come with a curved front, available in a left or right hand design with a bath screen included. So they are ready to install as soon as they arrive at your door. 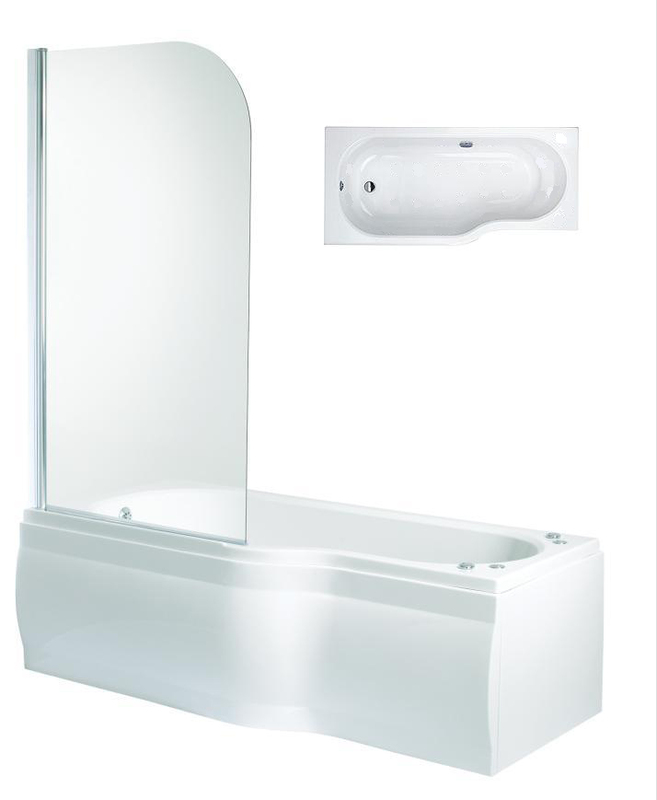 The Compact with dedicated bath screen is the ideal choice for the smaller bathroom. These shower baths also have a curved front and are wider at one end than the other, they are also available in a left or right hand design depending on your preference. If you have a modern bathroom the Taranto shower baths may be just what you are looking for with the straight front finish offering an elegant style that is wider at one end. Another of the modern designs is the Space shower baths which are also straight in design with a slight curve that gives your new bath that bit of texture and style. Which Bathroom Mirror Is Right For My Home? There are so many fantastic bathroom mirror designs available these days and choosing can prove difficult for many of us. There is a little trick I learned years ago when it comes to finding the perfect mirror, you need to look at the mirrors available and with your layout in hand, try and imagine the mirror on your bathroom wall, how will it complement the space, how will it be of convenience to you and how will it enhance your bathroom? Of all the mirrors available, my favourite is still plain bathroom mirrors, they are minimalistic in design, no frills or fuss and no additional lighting to wire in during installation. But that being said, you need to know all the mirrors available to decide which one will work best in your bathroom design. There are a number of bathroom mirrors that include lighting, such as the back lit bathroom mirrors. These mirrors offer convenience and practicality and are good when you have a smaller bathroom that doesn’t benefit from natural light, the additional lighting can make a huge difference in these bathroom designs. Then there are the infinity mirrors, I’m sure you’ve seen these before they have lights that seem to disappear inside the mirror. These are the ideal choice for the ultra modern bathroom enabling you to make your mirror a centre piece. Don’t be fooled though, these mirrors offer good reflections and additional lighting when you need it most. Then you get the bathroom mirrors which incorporate shelves. These are very handy in bathrooms where you are limited in storage space. You can place all your make up and other items on the shelves and have them within easy reach of the mirror. They are stylish in design and work in both the modern and more traditional bathrooms. There are my favourites, the plain bathroom mirrors. These mirrors have no lighting, no shelves, they are minimalistic which makes them the ideal choice for the ultra modern bathroom or the traditional bathroom. They come in a range of shapes and sizes which also means you can find one that works well with your overall bathroom design. With so many bathroom mirrors to choose from, you do have to take your time and try and imagine the mirror on your wall. Remember a bathroom mirror should be a convenience but at the same time it should reflect light and be stylish, all at the same time.